Proud new owners provided “sweat equity,” building 70 percent of homes. 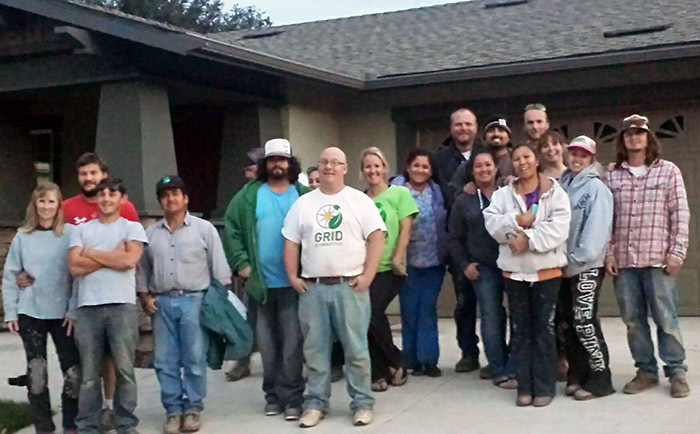 Atascadero, CA, November 24, 2014 – Twelve families who worked together to build the majority of their brand new homes under the supervision of Peoples’ Self-Help Housing (PSHH) will receive the keys to their homes during a December 4th ceremony. Having begun construction in early 2013, the Self-Help Home Builders’ hard work will pay off during the 2 p.m. ceremony at the houses on Atalaya Street in Atascadero. Along with PSHH, loan assistance was provided by the U.S. Department of Agriculture (USDA). Ronald Tackett, Area Director for USDA Rural Development in California, will officially present the families with their house keys. Atascadero Mayor Tom O’Malley will also be in attendance. The low income households worked together to perform 70 percent of the construction for the three- and four-bedroom houses. This included forming the foundations, framing, roofing, siding, interior finish and landscaping. Subcontractors took care of some of the specialty work, including plumbing, heating, air conditioning, electrical, drywall, and stucco. The homes are very energy efficient, meeting Energy Star 3.0 requirements, and local nonprofit GRID Alternatives Central Coast installed photovoltaic solar systems on the homes that aren’t shaded by mature oak trees in the area. The houses also have two baths, two-car garages, large porches and feature tile and laminate flooring. The families’ labor, or “sweat-equity” reduced the cost of the homes and eliminated the requirement for a down payment. The USDA provided construction and mortgage loans. The public is invited to attend the 2 p.m. December 4 ceremony at 5461 Atalaya Street and tour some of the homes afterwards. For more information, visit www.pshhc.org. Ronald Tackett currently serves as Area Director for USDA Rural Development in California and primarily works in Business & Cooperative programs working in Economic Development in Rural California, delivering the Business & Industry Guarantee Loan Program for rural California. He has worked for USDA Rural Development for the 22 years. Prior to his service with USDA, Tackett worked for NPI-Ag Service, a bio tech seed company in Oregon. He is a graduate of Washington State University with a Master's in Agricultural & Regional Economics and a B.S. in Agri-business. He resides in Chico.